This cartoon shows the transiting planet GJ 1132b to scale against its host star GJ 1132. A newly discovered planet 39 light-years away is being called the closest Earth-size exoplanet ever discovered — and a potential "Venus twin" — providing the mouth-watering opportunity for a close-up look at the environment on a rocky alien world. One of the dire frustrations of studying planets around other stars (and, really, any astronomical object) is their distance from Earth, which makes it onerous or impossible to get many basic details about them. Exoplanets are doubly frustrating because any light they emit (light that would give hints about what's happening on the surface) is often overwhelmed by the light of the parent star. Deming, a professor of astronomy at the University of Maryland, wrote about GJ 1132b in a "News & Views" article in the Nov. 12 issue of the journal Nature, noting that the "significance of this new world derives from several factors." The first of those factors is its size — only 1.2 times the mass of Earth — and second is its proximity — only 39 light-years from our sun. These factors earned it the title "closest Earth-sized exoplanet yet discovered," by a statement from the Massachusetts Institute of Technology. "Our galaxy spans about 100,000 light-years. So this is definitely a very nearby solar neighborhood star," Zachory Berta-Thompson, a postdoc in MIT's Kavli Institute for Astrophysics and Space Research and lead author of the paper announcing the discovery, said in the same statement. Most of Earth-like or Earth-size planets known to science are hundreds or thousands of light-years away. Kepler-452b, discovered this past July and dubbed the most Earth-like planet found so far, is 1,400 light-years from Earth. Conversely, the recently discovered HD 219134b is only 21 light years from Earth, but is 4.5 times more massive as our home planet. There's more that makes GJ 1132b prime for observations. GJ 1132b was discovered using the MEarth-South telescope array, which consists of eight 40-centimeter telescopes located at the Cerro-Tololo Inter-America Observatory in Chile. The array hunts for exoplanets with the transit method (also used by the Kepler Space Telescope), which looks for regular "dips" in the amount of light coming from a star. The dips indicate that a planet is passing in front of the star. It takes 1.6 days for GJ 1132b to make a single trip around Gliese 1132, its parent star (which means its orbit is smaller than Mercury's). This is a bonus for astronomers because it means the planet is frequently in view. A planet close to its parent star is hot like Venus, but rotates quickly and could have a substantial atmosphere. 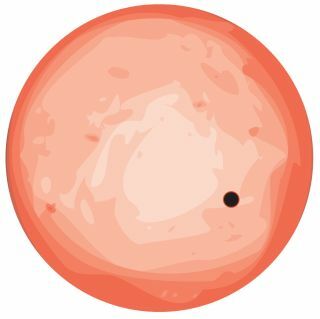 And there's more: the transit method of exoplanet detection offers the possibility of studying the planet's atmosphere — if it contains oxygen and water, or even signs of life; the wind patterns; even the color of its sunsets, according to the statement from MIT. As the planet passes in front of the star, light passes through the planet's atmosphere, and picks up information about the chemistry therein. Gliese 1132 is an M-dwarf star (also known as a red dwarf) only 21 percent the size of the sun, and emits only one-half a percent as much light. While the planet's size compared with its parent star makes it very non-Earth-like, this is also a significant advantage for observations because the light from the star doesn't completely overwhelm any reflected light that could be collected from the planet. Despite this, GJ 1132b orbits very close to the star, receives significantly more radiation than Earth, and thus has a surface temperature much higher than Earth: 275 to 580 degrees Fahrenheit (135 to 304 Celsius), which would make it similar to Venus. "Our ultimate goal is to find a twin Earth, but along the way we’ve found a twin Venus," said astronomer David Charbonneau of the Harvard-Smithsonian Center for Astrophysics (CfA), in a statement. "We suspect it will have a Venus-like atmosphere too, and if it does we can’t wait to get a whiff." The MEarth-South telescope array, located on Cerro Tololo in Chile, searches for planets by monitoring the brightness of nearby small stars. This photograph shows the array, comprising eight 40cm telescopes, at twilight. "If we find this pretty hot planet has managed to hang onto its atmosphere over the billions of years it’s been around, that bodes well for the long-term goal of studying cooler planets that could have life," Berta-Thompson said. "We finally have a target to point our telescopes at, and [can] dig much deeper into the workings of a rocky exoplanet, and what makes it tick." In the search for life elsewhere in the universe, some scientists think the community should target Earth-size planets around M-dwarfs because it is relatively easy to study their atmospheres, and because they may be fairly common in the galaxy. Perhaps, among this population of planets, scientists will find an alien world with the right setup to support life. GJ 1132b could be an important step toward that discovery. "But even if life is abundant in the cosmos, finding unambiguous spectroscopic evidence of it is a daunting task that lies in the indefinite future," Deming wrote. "Observations of small stars, such as Gliese 1132, loom large in this task." An in-depth study of GJ 1132b could be conducted by the Hubble Space Telescope, or better yet, the James Webb Space Telescope, scheduled to launch in 2018. Berta-Thompson said he thinks GJ 1132b is "going to be a favorite target of astronomers for years to come."